(Bloomberg) -- President Donald Trump said he may sign an accord to formally end the Korean War with North Korean leader Kim Jong Un at their June 12 summit, and raised the possibility of later hosting Kim at the White House. Trump predicted “great success” in the talks with Kim. He said the public will able to tell the outcome based on his language. Trump said that if again starts to talk about his “maximum pressure” campaign on the country, that would indicate a breakdown in negotiations. He added that if the talks don’t go well he has a list of 300 additional sanctions against North Korea he’s ready to impose. 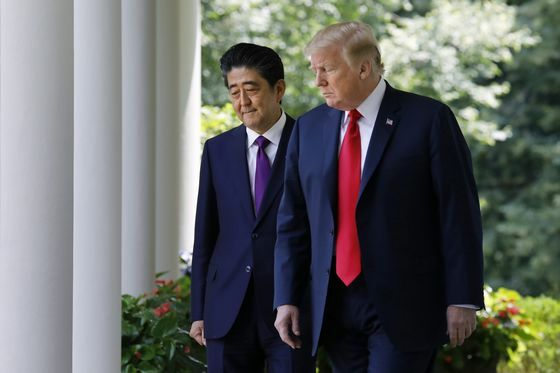 Trump and Abe met at the White House days before the summit. It will be the first face-to-face meeting between a North Korean leader and a sitting U.S. president. Trump aims to persuade the North Korean dictator to give up his country’s nuclear arsenal in exchange for relief from U.S. economic sanctions. The White House wants Kim to commit to a timetable to surrender the weapons at the summit. Trump has promised investment in the under-developed country would follow. Abe has been pressing the U.S. to ensure it protects his country’s security concerns such as addressing North Korean short-range missiles capable of hitting Japan, maintaining U.S. military deployments in the region, and returning Japanese citizens abducted by North Korea. Trump, meanwhile, has suggested that he may lean on Japan and South Korea to contribute financial assistance to North Korea as an incentive for Pyongyang to take steps toward denuclearization. Abe said he wants to “directly face” North Korea over Japanese abductees and he is “determined” to ensure they return home to Japan. Unprompted, Trump also brought up Otto Warmbier, a college student from Ohio who was detained in North Korea in 2016 and died after he was returned to the U.S. with brain damage in 2017. Warmbier’s parents allege Kim’s regime murdered their son and are attempting to sue the country.